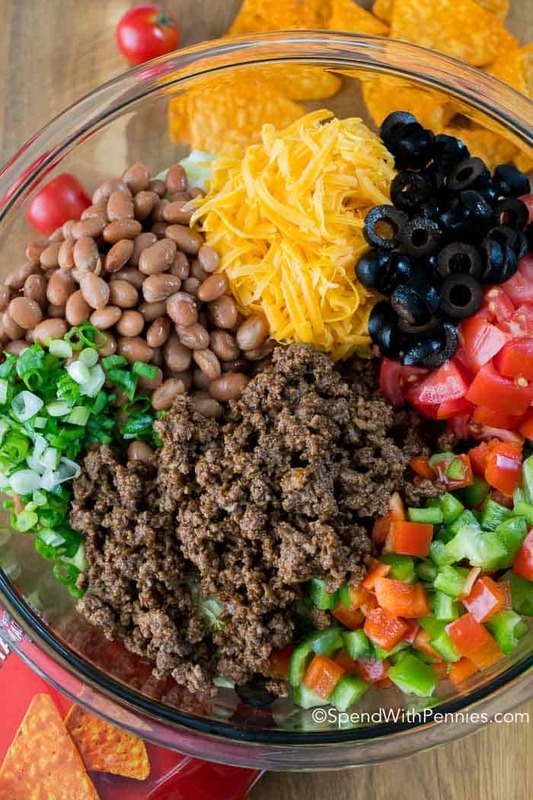 Everyone loves a great taco salad recipe and this version is a definitely a crowd favorite! 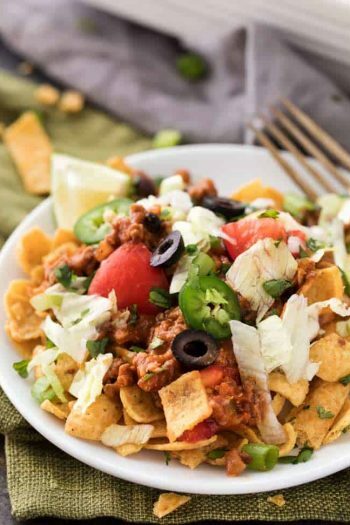 Seasoned ground beef, fresh lettuce, pinto beans, veggies and of course Doritos all sauced up with a zingy dressing make this an exciting change to your daily menu! I truly love salads, but sometimes they can become a bit boring. 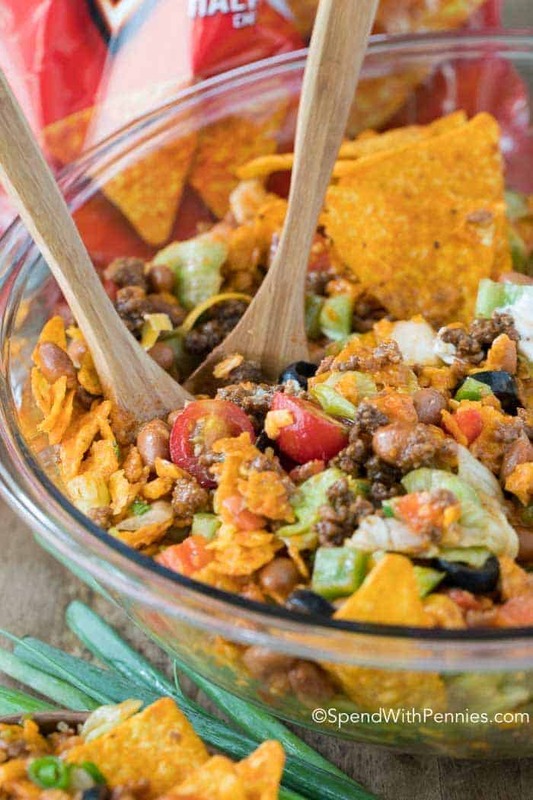 This Dorito Taco Salad definitely spices up the ‘same old salad’ slump that we tend to get into. 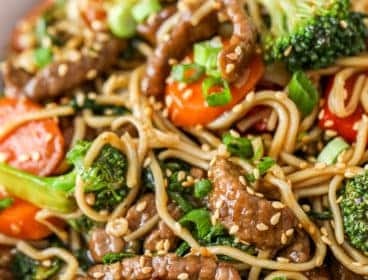 Not only is is easy to make, but it is delicious too! I absolutely love anything that is taco inspired from pasta to casseroles… and especially salads! Something about that beautiful blend of spices found in taco seasoning (especially my DIY taco seasoning mix) paired with crisp fresh lettuce just tastes SO good! Of all of the taco inspired dishes I make, this one definitely tops the list because everyone always raves about it! If you happen to have leftover taco beef from a prior recipe, it’s perfect in this taco salad recipe. In fact, I often make a double batch of taco meat to store in my freezer for extra quick meals on busy weeknights. It takes me just seconds to defrost it for quick tacos, taco salads or even for a tray of Loaded Tater Tot Nachos! The remaining ingredients are simple and easy to keep on hand. Pinto beans and sliced black olives in the canned variety are always staples in my pantry. Lettuce, tomatoes, onions, cheese, peppers and sour cream are items I always have on hand. And OF COURSE you can’t forget the Doritos, we love the Nacho Cheese Flavor in this taco salad but you can use your favorite flavor! This meal can be prepared ahead of time! The secret is to assemble everything in layers and simply toss before serving. Using the layered method keeps ingredients from becoming soggy. Your bottom layer will be the cooked and seasoned ground beef topped with the dressing. Next layer the pinto beans and sliced olives. Follow this with the peppers and tomatoes. Next layer is the lettuce and the onion. Leave out the Doritos until just before serving. 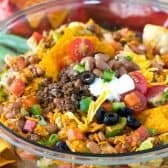 Using the layering method above, you can assemble this Dorito salad and refrigerate for a quick and easy meal at the end of a busy day or to take along to a backyard BBQ party or potluck. Simply toss to coat everything just before serving and wait for the compliments to pour in! You can modify this recipe however you’d like or based on what you have on hand! I have used diced chicken breast in place of ground beef (or ground turkey), I also use different types of peppers and I like to kick up the heat a notch using spicy Doritos! 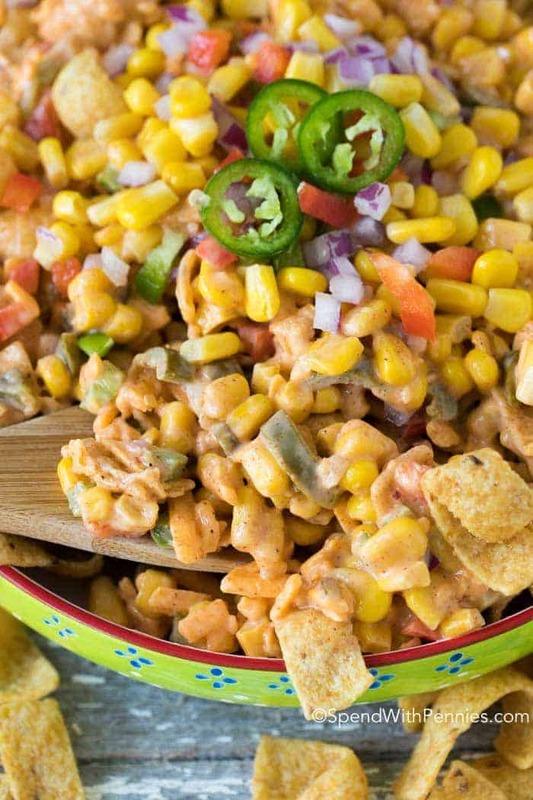 Use the veggies you love (corn is great in this recipe too) and make it your own masterpiece! It is just so easy to prepare and to top it off it tastes fantastic! 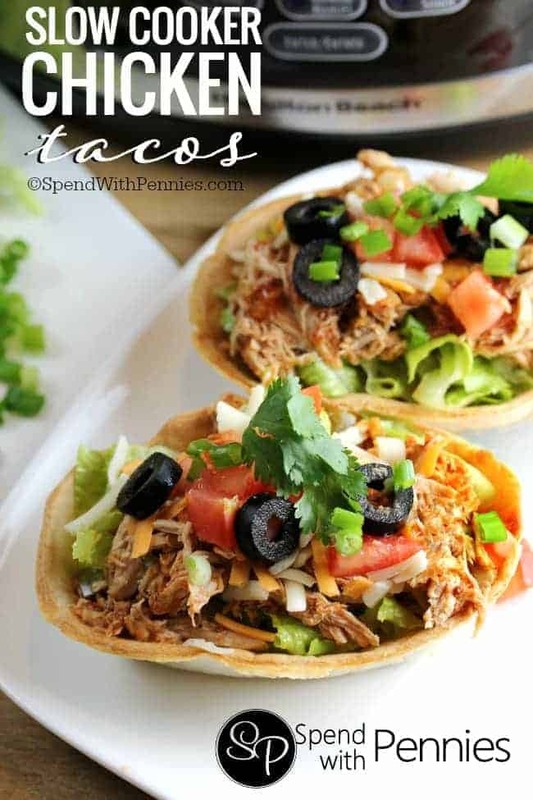 Love Taco Inspired Dishes? Me too… and here are some of my absolute favorites! 1. Taco Stuffed Pasta Shells Tender pasta shells stuffed with deliciously seasoned beef, salsa and cheese baked until bubbly. 2. Taco Pasta Salad Pasta salad with a taco twist, fresh veggies and our favorite Doritos! Must try! 3. Taco Tater Tot Casserole This casserole features seasoned beef and loads of vegetables topped with a yummy tater tot crust and baked until golden. 4. 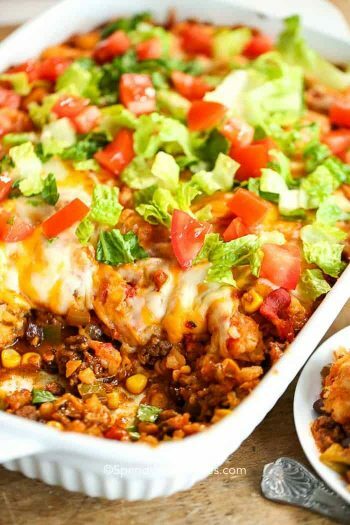 Taco Casserole with a Surprise Crust Taco night just got a whole lot more delicious… spoiler alert: if you like Doritos, you’ll love this one! 5. French Bread Tacos French Bread Tacos combine all the taco flavors you love with the delicious, crusty bread you can’t get enough of! 6. Layered Dorito Casserole Layered Doritos Casserole has layers of seasoned beef in a rich and zesty sauce topped with loads of cheese. While assembling the ingredients is super easy to begin with, to make it even easier I love to use my favorite chopping tool! 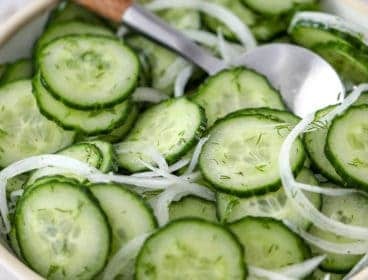 It makes chopping a breeze and you are guaranteed consistent bite sized pieces every time! 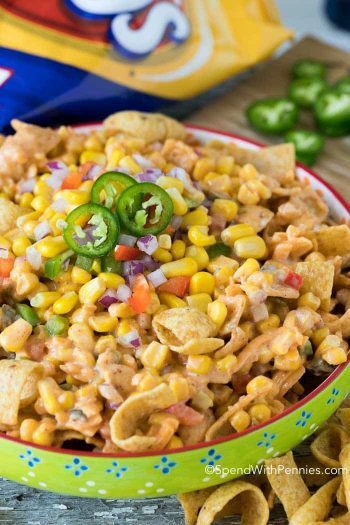 I use a whole 10 oz bag of Doritos in this recipe because I love the flavor they add. You can certainly use as much or as little as you’d like! Don’t get stuck making the same old salads this summer. 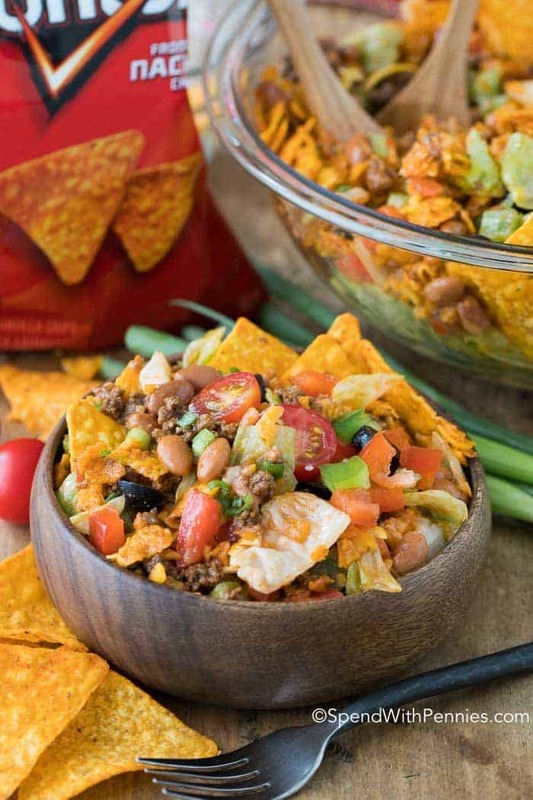 Add Dorito Taco Salad to your menu and delight your family and friends! Toss just before serving to avoid the Doritos from becoming soggy. I’ve made this salad since I was in my teens! I add picante/salsa to the Catalina dressing, absolutely delicious! Great additions Tammy, thanks for sharing! My family loved this salad. I would like to recommend that the first time you make it that you only place half the amount of Catalina dressing in. Then mix it up, taste , then add as much as your taste desires. I am so glad your family liked the recipe! Thanks for sharing your suggestion! Made this tonight and it was so big that now we have leftovers for tomorrow! No cooking, love it! Used the salsa and sour cream and the Catalina….great blend of flavors! Great recipe! Love the leftovers Cheryl! Happy to hear that you love the taco salad! I’ve made this for years and always asked to bring it to our work potlucks. No beans or avocado. The secret is in the dressing….Green Goddess dressing. Everyone I know now uses Green Goddess dressing. You will to! Yummy, I’ll have to add it to my “must try” list next time I make this! I’ve made this when my kids were younger, but used mayo & ketchup in place of dressing. Always had them on hand. Been years since I’ve had this. Yummy dressing idea, I bet it has a flavor similar to a thousand island dressing! Thank you for sharing Phylis! I like my taco salad with plain white corn tortillas chips and French dressing. My favorite go to food. Romaine lettuce has more nutrition and sweet onion chopped and friend with the hamburger is another step I take. Thanks for sharing your recipe. It was the first I ever tried. I love Taco Salad!!! I’m glad to hear you love the taco salad Katie! I’ve always used French dressing also (yes the orange one ). My daughter and I have made this for years. So yummy !! Love your dressing idea!! Thanks for sharing! I’m so glad you loved it, shredded chicken is such a great idea! Great shortcut! Thanks for sharing. So good! It says about 524 calories, just wondering for how big of a serving? The recipe makes 8 servings Lynda. Enjoy! I mix up everything except dressing, doritoes, tomatoes and lettuce…..I use sweet onions instead of green, 1/2 cup, because of my husbands ulcer. 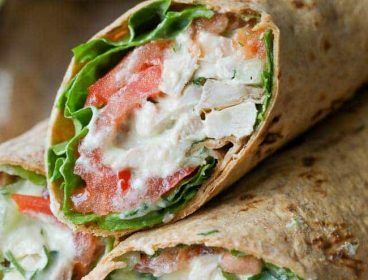 Then I can serve it once, skip a night and serve it again adding the dressing, tomatoes and lettuce and serving it ON the doritoes…..works great for two people and is fresh. This is a very good recipe for gatherings or for a home meal. Great way to turn it into a make ahead meal, thank you for sharing! It’s literally my favorite ever! It’s called the Vidalia Chop Wizard and you can get it here on Amazon! Please read your ingredient list and make correction. It reads “1 o oz Doritos”. I now know you mean 10 oz but it looks confusing using letter o instead of number 0 and space between 1 and 0. Thanks! BTW salad is delicious. A typo fixed! Thanks Beverly Ann. Glad you love the salad! Thanks Beverly Ann, I did just double check the back end of the recipe and it is in fact entered as 10 oz. I’m not sure why it’s showing a little space in there. Great salad. However, it would be nice to click on the link to the recipe and actually see the recipe instead of someone’s opinions and yapping for 2 pages before you even get to what you clicked on the link for. So glad you enjoyed the salad! This is my blog so you will definitely see me yapping before hand on every post :) . I do try to keep it to useful information to ensure success for readers (as well as share my opinions about a particular recipe). We do have people of all different levels of skills with all different dietary needs so I answer as many questions as possible in each post. Yummmmmmmm!!!!!!!! Only thing extra i added was avocado……. I clicked on the print button above the recipe and it still will not print out a copy. Just wanted to let you know. I am able to print when I click this Beverly. Do you have pop ups blocked? It opens a print friendly version in a new window for you. How did you keep avocado from turning dark? 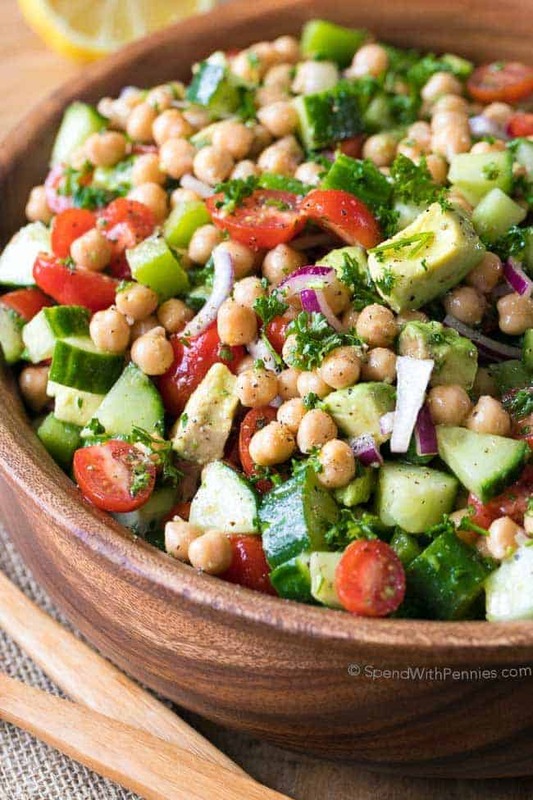 We love this salad and eat it a lot during the summer. I let people assemble it themselves by putting the ingredients in separate bowls or containers and pass them starting with the lettuce. Leftovers keep better that way. If my hubby doesn’t have any for lunch the next day he’s disappointed. My dressing is Catalina + sour cream + ortega taco sauce — proportioned to taste and mixed together with a whisk. Always a hit. That is such a great idea Terrie. Thank you for sharing! So glad to hear it’s such a hit! I made this on Mother’s Day, the only change was to use the whole can of olives. LOVED by all. Delicious!! So glad you guys loved it Donna! I have been making this taco salad for over 30 years! Only I put in black beans instead of pinto beans and I put in about equal parts of French dressing and medium taco sauce. The taco sauce gives that extra little zing to the salad. Amazing!!!!!!!! I put it all to side. Peeps could choose that way!! I put it all together as recipe called for….. AMAZING!!!!!!!!! So glad you loved it Paula! And great idea!! Use seasoned diced chicken, add drained + rinsed black beans and a can of drained whole kernel corn. Also I liked it with a little mild salsa. The beef goes in the bottom if you are layering it to make it ahead of time. If you’re going to be serving it right away, the beef can just go on top before tossing. Hope that helps. I have always used italian dressing with those recipe instead of Catalina! It gives it a niceness zesty taste! Also have tried the spicy ranch dressing! So good! So glad you loved it Ronda! Recipe may be good but wondering why it can not be printed out as a recipe & not waste a large part of the page where the video is? Just make it simple, please. I’m sorry for the inconvenience, I am not sure why it is printing that way. Thank you for letting me know, I do have someone fixing it today! 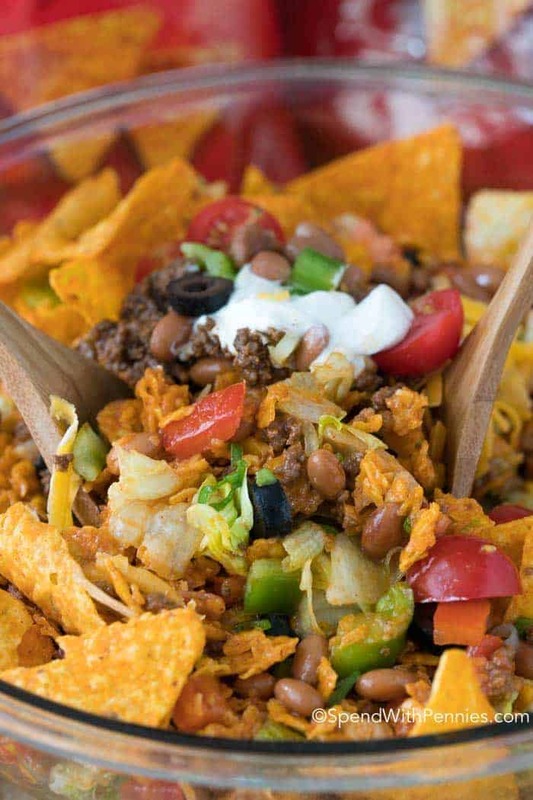 Oh my gosh this Dorito Taco Salad is to die for (figure of speech)…I love it and i wouldn’t change nothing. Did I say I love this salad!!!!! So glad you love the recipe Annetta! A forgiving recipe Peter! Glad you loved it! 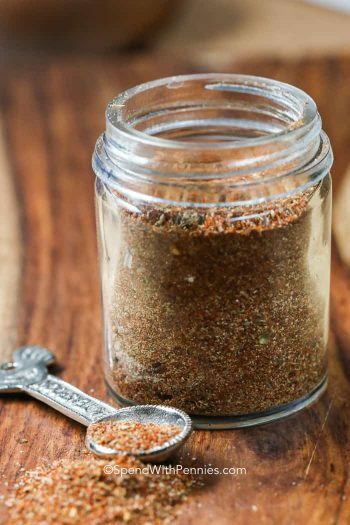 How much your homemade Taco Seasoning do you use in place of the packaged seasoning? For one pound of ground beef, I use 2 tablespoons of homemade taco seasoning. You need to make it easier to print out!! 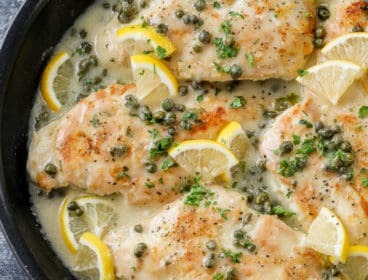 Make this tonight for our Bible study dinner. There is a print button right above the ingredients. Hope that helps. Enjoy, Faye! You need to make it easier to print out!! Thanks for this I think I found it on Facebook and thought heck yeah I wanna try. I made this tonight (25th April 2018) and I have made enough for 2 dinners LOL I left out the pinto beans due not enough money oops maybe next time and I used (mild) Nachos Topping from a jar instead of the mentioned dressing. The salad was a bit “heavy” looking but still tasted awesome and filling too. It was like fireworks going off in my mouth. I will make this again for sure and told my friends on Facebook all about it with links so they cam make it too. Thanks again so much THIS IS A KEEPER!!!! 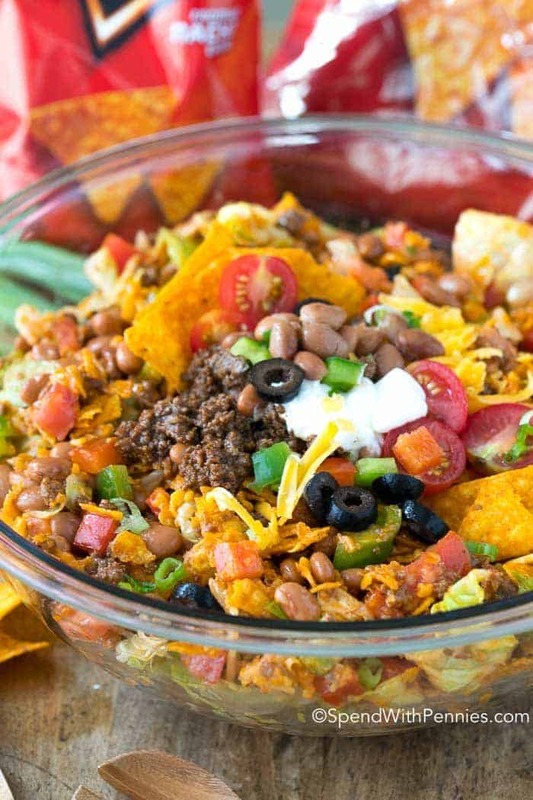 For the DORITO TACO SALAD… The recipe calls for 1 oz. of Doritos. Did you mean 17 oz.??? In the video, is shows Holly using a family size bag. Please help!!! I can’t wait to make this! 5* Recipe! 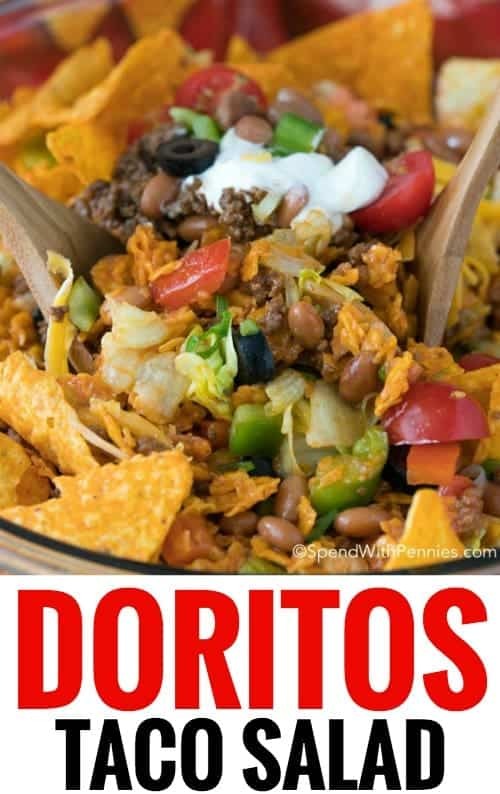 I usually use a whole 10 oz bag of Doritos (as listed in the ingredients) in this recipe because I love the flavor they add. You can certainly use as much or as little as you’d like! my mom has been making this forever now it’s one of my best party dishes nobody can get enough. we use creamy Italian dressing . the shoprite brand is the best to use . I can eat it allday its normally the first thing to go at family gathering and is the most requested when we ask what can we bring. awesome summer meal as well! That’s so great to hear Amanda! You’re right, it’s great for both a meal AND a party dish! Have you ever used pickle juice in the pasta water? I do that sometimes when I make my favorite Dill Pickle Pasta Salad :). I love it! i’ve been making this forever and a day. Only difference if that I use kidney beans, red onion and good seasons italian dressing. This is so good…just reading this makes me want to go out and buy the ingredients to make this weekend. 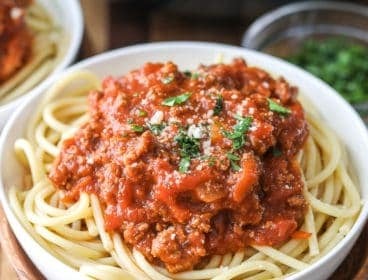 Delicious dish and easy to make. I use Western dressing instead Catalina dressing. It very good also. Could you use ground turkey instead of the ground beef? Trying to make it a bit healthier. 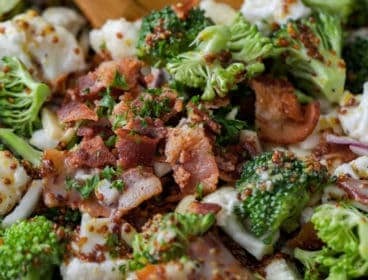 Has anyone used this recipe for meal prep for a few days? Well I just made this about 10 minutes ago, I don’t get to have any unfortunately since I’m on a specific diet (required to eat very specific combos at a time, this salad isn’t included) but my fiance is gobbling it up right now! It looks really tasty. I would say though, a full 16 oz bottle of dressing + sour cream + the taco meat seasoning makes a LOT of sauce, it looks like way more than what you used in your video, did you only use about 1/3rd or 1/2 a bottle in that shot? I used an overly-large head of lettuce too, I think next time I may use 1/2 a bottle and 1/2 the sour cream (only added two spoonfuls to the meat after cooking) and see how it turns out. It depends on the size of the lettuce as you’d mentioned, I agree, I only tend to add a bit of sour cream as garnish. Waste of $22.00! This was edible but definitely nothing to write home about or ever make again. Made for Super Bowl party and only one out of 24 people said it was good. Not sure if it’s the dressing and maybe better with ranch, but definitely feel there is much better recipes then this for taco salad. Sorry this didn’t work out for you, I’m so surprised to hear that out of 24 people only one person enjoyed this. 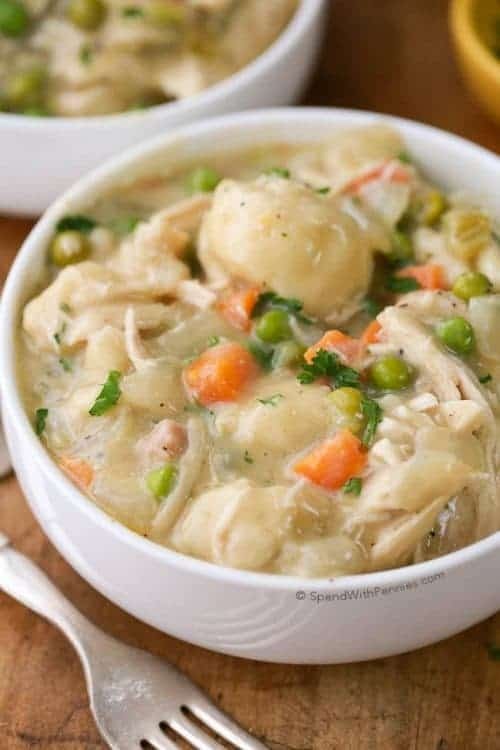 We absolutely love this recipe and have been making it for years… I come home with an empty bowl every time! VJONES I have an idea – if you can get a jar of NACHOS TOPPING where you are.Tthat can make a difference I did this tonight (25th April 2018) and it was awesome. So don’t give up have another go maybe with a smaller “test” group of people to see if you like it. We really liked this recipe as is and also made a vegan version, they both turned out quite well. Loved the salad but just as an FYI, the layered method doesn’t mention the cheese. I assembled the layers and almost forgot the cheese. But I did get lots of compliments. Thank you! I’ll update that right away! Always use taco Doritos and Ranch dreasing also use taco seasoning but instead of adding water I use taco sauce mixed with the meat and seasoning The taco Doritos give it better flavor. I have made this several times and my husband and I absolutely love it. We don’t use the beans or the Catalina dressing but lots of salsa and sour cream. This was a classic recipe in my home for years. Thanks for reminding me of how nutritious and delicious this favorite recipe is! Love it! I am planning on preparing it for our family tomorrow! Best taco salad! My whole family loved it! I made this and it was awesome!!!!!!! Glad to hear you loved it Andrea! Happy to hear that you enjoyed it Valencia! It is good with Avacado too. I always used a bottle of French dressing. I have been making this for years. As for the dressing, I like Dorothy Lynch, but this salad needs sweet tanginess of the Catalina. Lynch is a little too ‘smooth,’ to me. Also I have always used original Fritos for the ‘crunch.’ They are thicker, so don’t get soggy at all. We have been making this since 1977 and it is the most requested dish we are asked to bring to a Potluck. The only thing with our dish is we use Creamy Italian Dressing and people say they like it so much more than Catalina. We also use Taco Flavored Doritos now that they are making them again and Kraft Taco Flavored Cheese (it has Mexican spices added). We leave out the bell peppers.Yes, do not add the Doritos or Dressing until just before serving. Did you ever make this with ground chicken instead of beef. You could definitely try it with the chicken! I’ve been making this salad for years and it’s always a hit. In fact, I am taking it to a family reunion this Sunday. I leave out the black olives (not a fan) and I use ground sausage instead of beef and kidney beans instead of pinto beans. I mix medium taco sauce (1 part) with western dressing (2 part) for the dressing. YUM! These sound like yummy alternatives! I had made it with ground turkey for delicious results too! This is one of our family’s favorite recipes. Such a classic! The only difference in the way we make it is the dressing. We us thousand island mix it with taco seasoning before pouring it in the salad. That sounds like an amazingly tasty idea! Could you use avocado instead of the olives.what other kinf of dressing can you use if you don’t have catalina?when I make my enchilada casserole I use the Mexican cheeseinstead of the cheddar cheese.I really want to try this.it sounds so good. What is the per serving nutrition information? This is very similar to how I make it (–minus bell peppers LOL) and I just use Vidalia onions. I prefer it with taco sauce as the dressing though.. 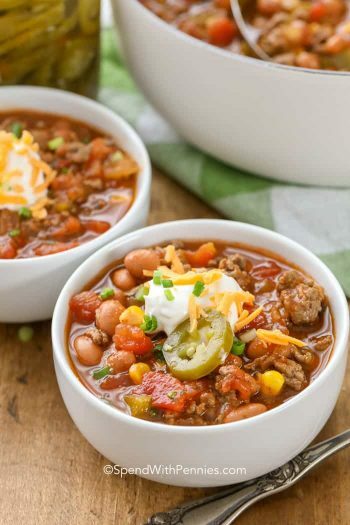 It is also good if you just add hamburger without the taco seasoning if you do not have it but then you really would want to use taco sauce as the dressing to give it that taco taste. This looks so delicious. Do you cook the beans first or just pour them straight from the can? I take them right out of the can (and give them a quick rinse to remove some of the sodium). My Mom made this for us when I was a kid , then I made this for my kids and now my daughter makes it for my grandkids. We love it. I add them in to heat up with my ground beef, but unless you want to eat it when the meat is hot it does not really matter. I have had it both ways but prefer hot beans and ground beef. I do not add peppers but everything else is the same! Awesome recipe and I am sure the peppers would be good if you like those. My husband and daughter loved this recipe! The organization of the layers is the only thing I changed. The Doritos were put in individual bowls. All of the ingredients in step 3, the meat, and dressing were tossed together in a large bowl. It was spooned on top of the Doritos just before serving.I garnished the salad with cheese and sour cream. Question – in your video you use a tool to dice your peppers – can you provide a link to purchase that magical device? That’s my favorite chopper! You can get it here on Amazon (it’s called the Vidalia Chop Wizard). Made this with vidalia onions in lieu of spring onions. 1/2bag of doritos, and I only had Romaine lettuce. Made a very large salad and it was delish. We had enough for dinner and two lunches,. Usually I do not care for left over salad, but it was so good, I would have eaten it for another lunch. Great! Thanks! I’m making it for dinner tonight! The recipe is a bit confusing. At one point you say put the meat on the bottom, add the dressing and mix everything together. Another time you say layer it ending with the meat and drizzling with the dressing. So I’m not sure how to put it together. If you’re going to eat it right away, just put it all together, mix and enjoy. If you are making it ahead of time to serve later, you can put the meat at the bottom and layer it as suggested to keep the ingredients from getting soggy. Mix everything together just before serving. I made this recipe and loved it! I mixed all of the veggies (minus the peppers). To keep the salad greens from getting soggy, I did not add the ground beef to the entire salad. Instead, I served the seasoned beef as a garnish for use on individual servings along with the crushed chips (salad bar style). I mixed the Catalina with ranch dressing and a dash of taco seasoning. I served on the side for use on individual salads (to taste). Chips stay crunchy, and you end up using less dressing. Delicious! Thank you! :) We are so glad you enjoyed this recipe! I spotted your recipe on Facebook and decided this looked like something I’d like to try. Thanks for the handy print option and for sharing this yummy looking dish! You’re so welcome, enjoy Cathy! In the video you were using a tool to break up the ground beef and I was wondering what it was. This is called the Mix and Chop or the Chop and Stir and you can find it on Amazon. Fyi pampered chef sells it too….works great ! Dorothy Lynch dressing is the only way to go with this. I’ve never had Dorothy Lynch dressing but it looks delicious, I’m going to have to give it a try, thank you for sharing! I love Dorothy Lynch, but I haven’t seen it in years. This recipe is dinner tonight, thanks for sharing it with us, Holly!! For our dressing we pour a packet of taco seasoning into an almost full bottle of Dorothy and shake it up, it’s amazing! I like this recipe but I’m a huge pico fan so I would omit some of your veggies and switch it up for tomatoes, sweet onion, cilantro, lemon, garlic and a pinch of salt and use salsa instead of dressing. You’re welcome Cheryl, enjoy! The peppers are added in step 3 after the lettuce but you’re right, I did mention the green onions twice! I’ve updated the recipe. Thank you for letting me know! This looks delicious, have you ever used salsa in it? I haven’t but that would be a delicious addition, thank you for sharing! Thank you so much Averie! I love Dorito salads too, such a classic recipe! I have been making this salad since the late 70’s and it’s always been a hit. The only thing different is I use Richlieu Western Dressing and no olives or sour cream (don’t like them). I never bring home leftovers and always have to have the recipe with me. It’s wonderful for a hot weather meal.